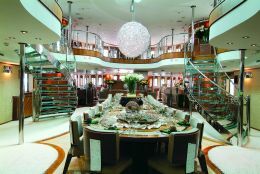 A meal aboard M/Y Sherakhan is a refined art, both on special occasions or for formal dinners in the dining room, but also for delicious lunches on the aft deck at the round table seating 22. The chef can prepare ad hoc menus of any kind whatsoever, for all tastes and diets. So we descended into his kingdom, the galley, by way of a staircase leading from the lower lounge, right by the bar. We wanted to make the acquaintance of this famous chef, Arend Nieboer. The previous evening there had been a dinner for 100 people, but now order reigned everywhere and the chef had the very kind idea of cooking some of his delicious, elaborate dishes for us alone. He welcomed us with his staff and showed us around the huge, magnificent galley which is developed along the walls on a rectangular plan with two large islands in the middle. It's an absolutely professional workplace in stainless steel. The visit to the freezers was a surprise: two rooms, the largest 6 x 3 metres, so the vessel has considerable range before having to take on supplies. While inside talking we felt ourselves literally starting to freeze and had to get out quickly. Many of the provisions were in full view in the galley: fowls, coloured vegetables, lobsters, cheeses, all top quality produce that the chef selects personally on the basis of the season and his favourite markets. An important meal involves ten courses, a formal dinner five. Lunch is somewhat easier, with ethnic buffets: Italian, Mexican, Indonesian or Spanish. However the cuisine of M/Y Sherakhan's chef is fundamentally inspired by French cookery with a few flashes of imagination. His culinary training began at the age of 16, first on yachts and later in hotels. 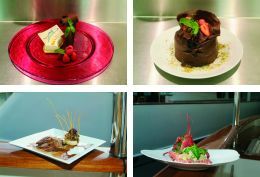 He then attended a school of haute cuisine for five years and shipped aboard American line cruise vessels. 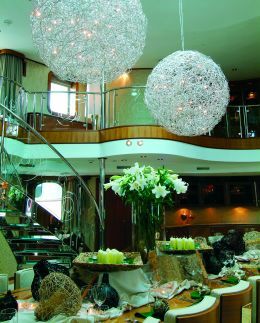 He ran a restaurant in Amsterdam for 15 years before taking up his present position aboard M/Y Sherakhan. What he likes about his work on this yacht is the great freedom he has in the execution of his dishes and the fact that he can give his imagination absolutely free rein in a job he loves. As for Italian cooking, he especially likes certain items such as pasta, olive-oil, parmesan cheese and balsamic vinegar, and he defines it as "basic" with regard to its French counterpart in the sense that, in his opinion, it is the simple manipulation of excellent products and its perfection lies in this simplicity. Whereas French cuisine involves fairly difficult procedures of transforming ingredients in order to achieve complex results, as we could see in the dishes he prepared for us: a European lobster, a quail and two splendid desserts, but the result was overwhelming, both for the beauty of the presentation and the goodness of the food, truly the work of a top level professional. Chief Steward Peter Koolhoven talked to us about the importance of the wines carried on board. Over and above Italian and French wines, the M/Y Sherakhan cellar also included emerging wines from California, South Africa and Chile. Among the most requested Italian wines are Lambrusco, Chianti Classico and Pinot; among the French, Chardonnay, Chablis and of course Champagne. An important feature of life on board is the cocktail bar where all kinds of cocktails and spirits are served. At the hottest moments of the day, highly imaginative fruit cocktails are served. At 11 o'clock in the morning and in the afternoon there's yoghurt, fruit and ice cream in various combinations. M/Y Sherakhan's cellar contains 150 bottles of spirits and 620 of wines and champagne: what the customer asks for, the customer gets! Moreover, it has been noted that on a cruise guests have both the time and the desire to get to know wines in greater depth. 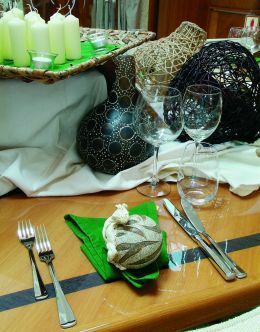 Of course preparation and decoration of the table is very important and is carried out artistically every day; porcelain, coloured glass spheres, flowers, ribbons and coloured wineglasses, not to mention the effect of the lights from the pool and from the candles. What's the secret of this successful yacht? 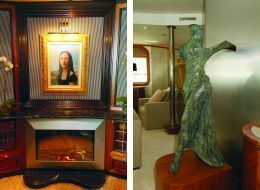 Undoubtedly the unitary and imaginative conception of the refit project, turning a beautiful old boat into a luxury charter yacht on the basis of no less than eight years' experience in the charter sector and of the owner's great professionalism, innate taste for design and modern art and his great sense of hospitality. Focusing on M/Y Sherakhan means talking about high quality interior design, an excellent chef, a well stocked wine cellar, a skilled and enthusiastic crew and, lastly, modern art objects scattered around everywhere. 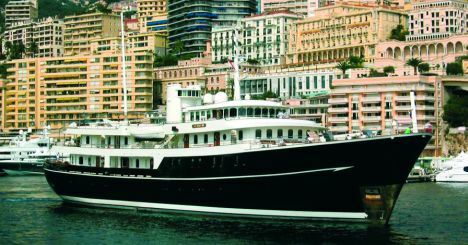 In fact this 69.65 metre yacht contains and incredible collection of beautiful things that evidently express the owner's cultural wealth, professional experience and passion for work. 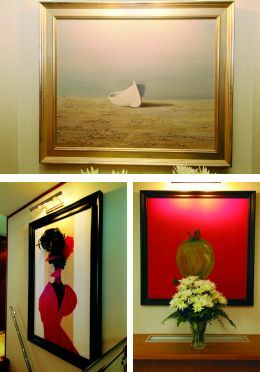 In fact the owner, with his life partner, created the interiors. Giving us a smiling welcome on the aft deck he explained that the design objects on board follow to some extent an Italy-Holland axis, countries in the avant-garde in this field. While the former are mainly distinguished by elegant refinement, full of the Made in Italy style which perhaps always has an eye on classical tradition, the latter are far more versatile and self-ironic, extremely creative and exciting, in a word extremely modern. In order to grasp this we need only think of the recent partial merger of Mooi, one of the trendiest Dutch brands, and B&B, a name by now classic in the modern Italian design sector. Forgive the verbal squabbling, but if you visit Holland from the viewpoint of interiors then compare it with the Italian design scene I think you'll agree with me. The link between the two countries in the design field is a given fact, but it was a pleasant surprise to find that this yacht represents an extraordinary synthesis. It's undoubtedly thanks to the cultural level of the project that M/Y Sherakhan's refit has been one of the most successful in recent years. The owner explained the philosophy behind the boat's conception: an event made up of many interlinked episodes, inspired not only by luxury but by fun understood as an intellectual game. In saying these things the owner introduced in a simple manner two essential concepts of interior design: the first is the importance of the human factor, however you want to consider it; the second is awareness that designing an object, in this case a boat, means giving it a soul. And M/Y Sherakhan's, as we were able to see at first hand, is a joyful and hospitable soul, as well as being extremely luxurious. The owner said goodbye, telling us that these were matters which greatly interested him but needed plenty of time for analysis. If we wanted to go into them in more depth we could continue talking in Holland, should we ever happen to go there. Then he made himself comfortable in an armchair on the after deck with a group of people, leaving us in the capable hands of his manager Jan VerKer, a marvellous smiling man who showed us the thousand secrets of the interiors. Going in from the deck there is a lounge area with three distinct conservation zones, each with white armchairs and sofas, and a very special music corner with a small white piano, a harp and a fine bronze statue that looks like a headless Nike and stands out against a lightweight and light- coloured wall that impedes vision of the rest of the saloon. We noted other pleasing furnishing details such as various custom built glass-topped coffee tables in wood, the electric fireplace, some vaguely optical pottery vases and traditional porcelain statuettes, some very fine standing lamps with polished metal bases and shades in both black and white. All very elegant and pleasant. Nevertheless it was only when we passed the bar that we were left simply astonished by the great split level dining room that appeared before our eyes in all its extraordinary beauty. 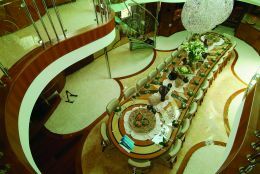 Two very spectacular curved staircases in metal and glass rise to the upper level where a curvilinear balustrade, with a transparent parapet like that of the staircases, overlooks the splendid view of the dining room. It was breathtaking! The aft stairway leads to the upper lounge while the forward one provides access to the cabin area. The truly imposing dining table seats 24. It is a fine piece of inlay work in wenge, light ash and teak, with structural details in stainless steel. The table stands in the middle of the floor in beige Italian marble, partially covered by a white handmade carpet (Jab) laid around the perimeter. The two materials are delimited by a dark undulating border that reinforces the pleasant effect of contrast in materials and colours. The atmosphere is pleasingly soft and light. The chairs are in wood, upholstered in white cloth. Above the table hang two enormous white spherical lights with a weightless structure formed by an incredible tangle of wires (Cattelan & Smith-Italia). The upper level of the saloon offers an inviting bar area surrounded by comfortable sofas and with a fine view from the large windows. Going out on deck you are struck by two great seats in wood, twisted and knotty, which look like archaic sculptures. Yet the most spectacular thing is that from the ceiling above the dining area, natural light filters from the glass bottom of the oval Jacuzzi, while at night you see the thousand coloured reflections of the little lights floating on the water. A screen and projector emerge from the ceiling for showing films. By means of wireless, everyone aboard can link up online. Going into the lounge bathroom we can't help laughing: opposite the WC there are very amusing and unusual pictures with three- dimensional elements that can be removed from the canvas. There are also many modern artworks on the balustrade and upper lounge walls. As for the problem of modern art, it has to be said that it isn't for everybody. But without a doubt it continues unstoppably on its way and has a market which, in certain ways and in due proportion, is keener than that of antique art. We proceeded to the night area. The huge owner's cabin is carefully designed both with regard to distribution of the abundant space and to quality of details. Six windows illuminate the great wall against which the wooden bed abuts, with bedspread, sheets and pillows in white and brown. 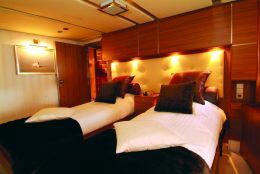 For relaxation there's a comfy armchair with pouf footrest in brown, while a large custom built chest of drawers in the centre of the cabin serves also as a handy surface. The modern design dressing table is very beautiful: when it is closed it appears to be a great lamp with a shade in milk-glass material and a steel stand. Venetian mosaics, handmade mustard colour Jab carpets and silk curtains in the same tone complete the décor of this cabin. The His and Hers bathroom, with separate shower unit, is faced in coloured glass tiles of French design and in marble matching the shade of the glass. This cabin also has a Jacuzzi and a small terrace for a leisurely breakfast. The owner's study converts into a double room with annexed bathroom.. M/Y Sherakhan introduces great richness, much personality and considerable flexibility into the interior design of a vessel built for charter. 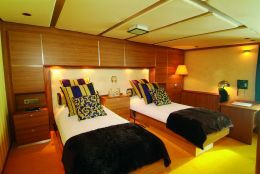 All the cabins and their bathrooms are unique in colours, cloth, materials and style. They all have a night fridge, a dressing table, a computer table, TV, DVD and SATCOM. The yacht can comfortably sleep 22 adults and 4 children. Of particular interest is the way the play of colours has been studied: highly refined in the daytime area where the various nuances of wood meet the various nuances of white cloth, carpets and lamps. Contrarily the cabins are very lively, warm and almost a bit ethnic, distinguished by decisive, sometimes contrasting but always intense colours. The result is brilliant because each cabin is masterfully and amusingly characterised in such a way that everyone can enjoy intimacy in a little highly coloured world of his own. The corridor floors in the cabin area is quite unusual, created with geometrical motifs in three materials: dark red glass, marble and wood. Since this was a modern-conception refit, M/Y Sherakhan has a vast beauty area called The Siren's Spa, after the handmade mosaic of a mermaid on one of the walls. 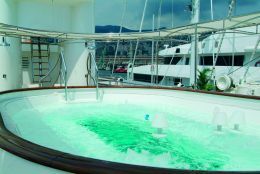 A fine 3 metre diameter Jacuzzi occupies the centre of the room, while there is also a bar, a sauna and plenty of gym equipment. The bathtub and two washbasins set in full view opposite the mermaid are exquisitely beautiful, in milk-glass coloured plastic illuminated by coloured lights. Soft music everywhere. All possible and imaginable treatments are carried out by a highly specialised staff: massage, beauty treatments, controlled sun- tanning. The Spa sanitary fixtures and fittings are high-tech faced in relief stamp metal and plastic materials, so they are extremely hygienic.